The MU College of Veterinary Medicine salutes our faculty, staff and students for their many achievements. We take pride in sharing their accomplishments. 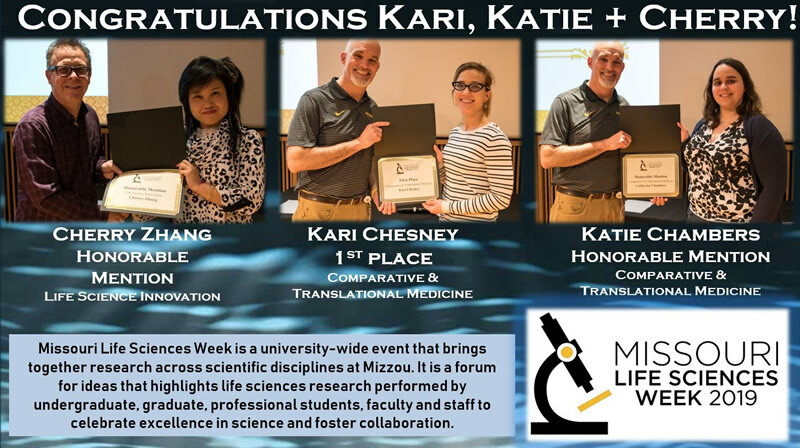 Kari Chesney and Catherine “Katie” Chambers, graduate fellows in the University of Missouri Department of Veterinary Pathobiology, and Chunye “Cherry” Zhang, a graduate student in veterinary pathobiology, each earned honors during the 2019 MU Life Sciences Week activities. 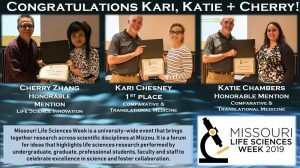 Life Sciences Week is a university-wide event that brings together researchers across scientific disciplines at Mizzou, highlights life sciences research by undergraduate, graduate, professional students, faculty and staff, and fosters collaboration. 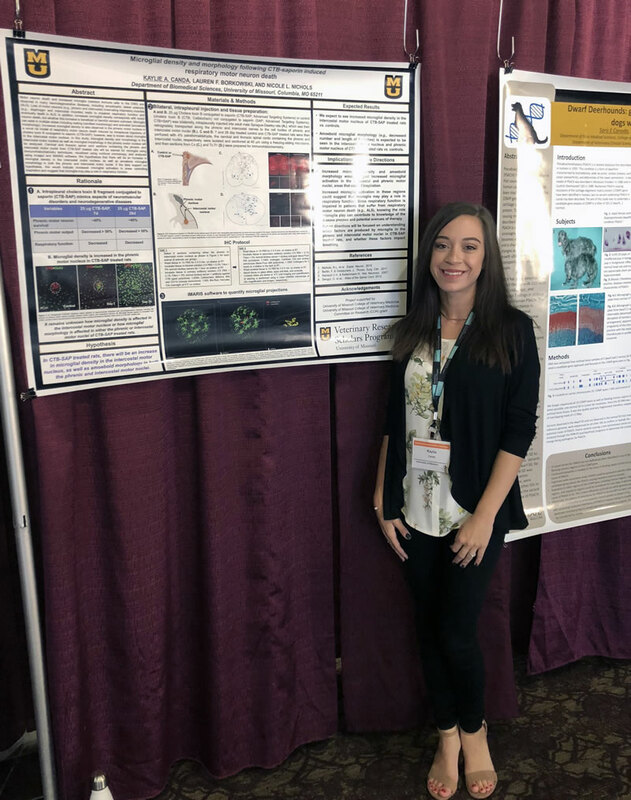 Chesney’s poster presentation on her research, “Modeling Crohn’s Disease: Identifying Environmental Triggers in a Genetically Susceptible Atg16l1 Rat Strain,” captured first place in the Comparative and Translational Medicine category. Her advisor is Elizabeth Bryda, MS, PhD, a professor in the Department of Veterinary Pathobiology. Chambers received honorable mention in Comparative and Translational Medicine with her poster, “L-1 is Protective in a Murine Model of Neonatal Meningitis-Associated E. coli Infection.” Her advisor is Jerod Skyberg, PhD, assistant professor of veterinary pathobiology. Zhang received honorable mention in the Life Sciences Innovation category for her poster on “The Influence of Gm Richness and Transfer Method on Disease Susceptibility in an Animal Model.” Her advisor is Aaron Ericsson, DVM, PhD, assistant professor in veterinary pathobiology. 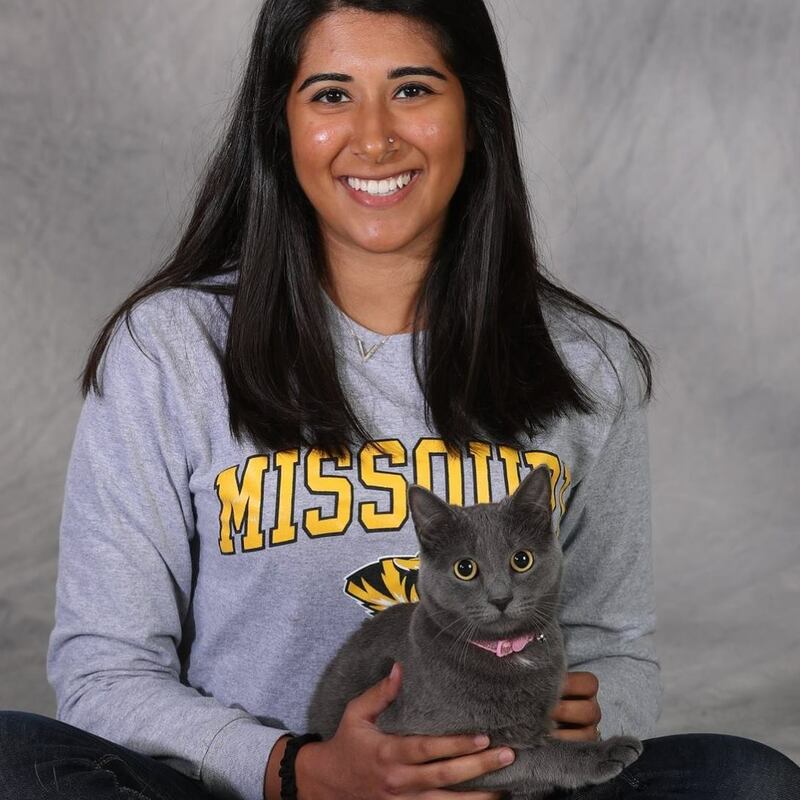 MU College of Veterinary Medicine first-year student Shefali Kaul received a grant from the Morris Animal Foundation to help fund a research project studying patterns in the gut microbiome of shelter cats. By identifying correlations between stress and health and changes in gut microbiome, Kaul hopes to find ways to improve shelter cat welfare through gut microbiome monitoring and manipulation. She will be working on the project this summer with the Veterinary Research Scholars Program and plans to continue her research into the fall. Craig Franklin, DVM, PhD, DACLAM, a professor in the CVM Department of Veterinary Pathobiology, and Amie Burling, DVM, MPH, DACVPM, DABVP (Shelter Medicine Practice), an assistant teaching professor in the CVM Department of Veterinary Medicine and Surgery, assisted Kaul in submitting the grant proposal to Morris Animal Foundation. 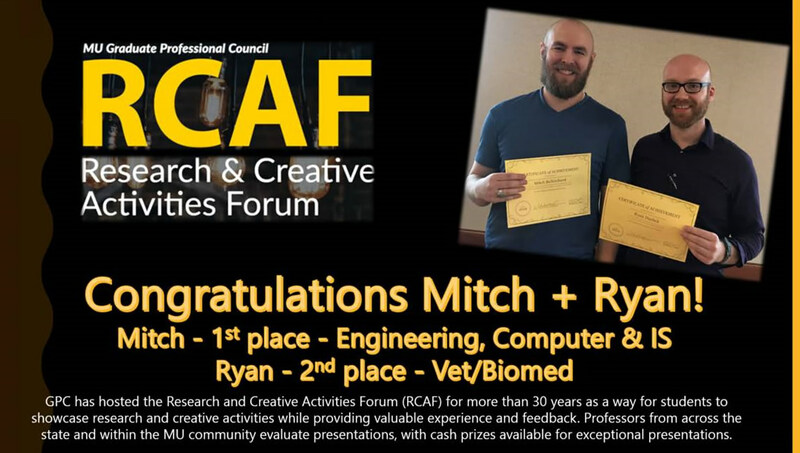 Mitch Bellrichard and Ryan Dashek, graduate fellows who are pursuing residencies in the College of Veterinary Medicine’s Comparative Medicine Program, recently captured awards during the Research and Creative Activities Forum held April 5 and sponsored by the MU Graduate Professional Council. Bellrichard took first place in the Engineering, Computer and Information Science category with his project, “Genipin Crosslinking to Promote the Attachment and Proliferation of Fibroblasts on a Ligament Scaffold.” Dashek’s project, “Characterization of NipSnap2 as a Potential Mediator of Mitochondrial Permeability Transition,” captured second place honors in the Vet/Biomed category. The MU GPC has hosted the Research and Creative Activities Forum for more than 30 years as a way for students to showcase research and creative activities, while providing valuable experience and feedback. Professors from across the state and within the MU community evaluate presentations, with cash prizes awarded for exceptional presentations. 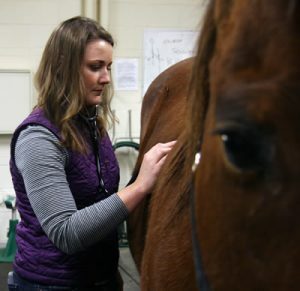 University of Missouri College of Veterinary Medicine second-year student Kaylie Canda was one of five students nationwide to receive a 2nd Opportunity Research Scholarship from the American Veterinary Medical Association and American Veterinary Medical Foundation. The 2nd Opportunity Scholarship is awarded to veterinary students who have conducted summer research, such as in Mizzou’s Veterinary Research Scholars Program, and who wish to further their studies during a second summer. Applicants submitted a two-page description of their research project and its impact. Canda said the award will allow her to continue her work in the laboratory of Nicole Nichols, PhD, an assistant professor in the Department of Biomedical Sciences. Canda is researching the roles of microglia and inflammation following respiratory motor neuron death. The work has implications for both animals and people with neurodegenerative diseases. Lynn M. Martin, DVM, MPH, DACVIM-Large Animal Internal Medicine, a postdoctoral fellow in the MU Veterinary Health Center Equine Hospital, successfully completed all requirements for board certification and was awarded diplomate status by the American College of Veterinary Internal Medicine Board of Regents for Large Animal Internal Medicine. Martin’s primary equine mentors were Professor Philip Johnson, BVSc, MS, MRCVS, DACVIM-Large Animal Internal Medicine, DECEIM, and former faculty member Dee Whelchel. Her food animal mentors were Assistant Professor Pamela Adkins, MS, DVM, PhD, DACVIM-Large Animal Internal Medicine, Assistant Teaching Professor Rachel Oman, DVM, MS, DACVIM-Large Animal Internal Medicine, Associate Teaching Professor Dusty Nagy, DVM, MS, PhD, DACVIM-Large Animal Internal Medicine, and Professor John Middleton, DVM, PhD, DACVIM-Large Animal Internal Medicine. 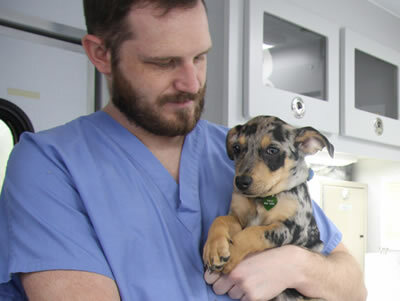 Martin completed the dual doctorate of veterinary medicine and masters of public health at Mizzou in 2014 and finished an equine private practice internship in San Antonio, Texas, prior to beginning a residency program at MU. Now, she continues as a postdoctoral fellow, serving as a clinical instructor in the hospital, teaching didactic courses and conducting research for a PhD in comparative ophthalmology. She expects to complete the PhD in 18 to 24 months.